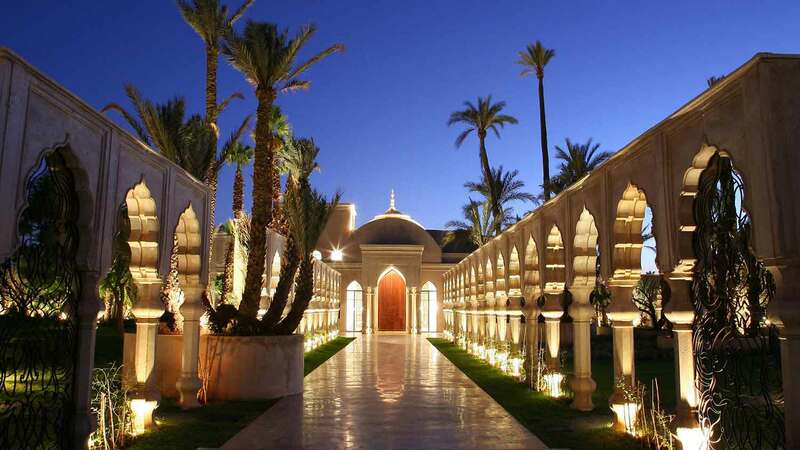 Arriving at night to this majestic Moroccan Palace, 30 minutes from the medina in Marrakech, was like stepping into a dream. Minarets and domes were lit up by candle-light and flaming torches. We could tell that this resort was going to be simply amazing, just by the amount of gratuitous space there was around; the lobby area was the size of a small hotel in itself. Walkways over tranquil shallow pools took us through landscaped gardens, giving the illusion of privacy and emptiness, even when the hotel was completely full. It took almost ten minutes to walk to our room, our butler apologising the whole way, but we were too enchanted by the wonderland of fire around us to care. The resort did not stop there in casting a magic spell, as the door to our villa – mansion, palace even – was opened. An enormous contemporary crash-pad awaited us: three huge spaces for living, sleeping and bathing, all with double-height ceilings. Beyond were a set of glass doors that opened to our private terrace and pool, a five-by-five-metre plunge pool, hidden from the view of others by arched walls and billowing muslin curtains. We had landed in paradise. Daylight confirmed it, the resort was indeed exquisite, and breakfast overlooking the hotel’s ‘main’ pool area was wonderful. Morocco’s French accent ensured the most delicious of pastries, meaning that we overloaded on carbs every morning, but looking around, the fabulously dressed clientele absolutely agreed. The only thing lacking in food options was some local flavour; on site eateries consisted of French fine-dining and Thai, go figure. The property’s distance from the centre is a bit of an issue for us explorers; every journey being a 300 Dirham ride and thirty minutes each way, but if you’re looking for a true hideaway from the madness of Marrakech, then this is it.